Use this led Sensor light for your garden, backyard, deck, porch, patio, pond, veggie patch, driveway, or any outdoor location that needs a light. As a weatherproof and heatproof light, it can be installed without fear of environmental damage. As a Day Charger, Install it outside and let the sun power it up. During the day the solar light will automatically switch off to save energy,at night it will turn on when motion sensor detected so you can find your way. As it only takes 6-8 hours to fully charge, its short charging time is ideal for those short winter. Perfect for patios, decks, pathways, stairways, driveways, garden, etc. when sensing motion it will activate the “bright light”. “Bright light” turns off 15 seconds after motion stops. The solar panels capture the sun’s energy during the day, providing up to 12 hours lighting after fully charged. It can be auto On/Off when motion sensor detected. 【Light Control+Induction】Omicoo 4 Pack LED Solar Wall Light made by 30 LED lamp beads, turn on at night when motion sensor detected , and automatically off after motion stops, max Reading Range between 3-5 meters,2200 mAh,17% energy efficiency that useful life can service more than 50000 hours. 【Solar Energy＋IP65 Protection class】IP65 Protection class,100% waterproof except for the back screw hole.Made of High-strength ABS,the wireless sensor light is water resistant and heat-resistant,security Lights for Outdoor and Indoor Use.The sunshine in the daytime charging will ensure lighting need, Charging these outdoor solar lights under directly sunlight in daytime(6-8h) can provide sustainable lighting up to 10 hours in night. 【Radar Sensors】The newest and sensitive radar induction mode enhances the sensitivity for solar light.The mounting distance is not less than 3 meters.2 installations+3 Modes Design:Light control mode/Radar induction mode/Sensitive Motion Sensor with Dim light mode for your choice.There two installation options are available:use screws nail it directly to the wall & Use Strong adhesive tape Alone and not need to drill ensure protect your wall. 【Primary Energy Efficiency Grade】Polysilicon solar panels with 0.55W Photovoltaic Power and 3.7V Working Voltage.The maximum lighting angle can reach 270 degrees, which provides fantastic convenience and security for your home or business accommodation. 【Energy-saving + Environment Friendly】The solar energy system provide the sensor light to save operating costs and achieve high energy usage,protect the environment start from around things.Security Lights can be used both indoor and outdoor.Perfect for using on front door, back yard, garage, driveway, deck, patio, even on RV. 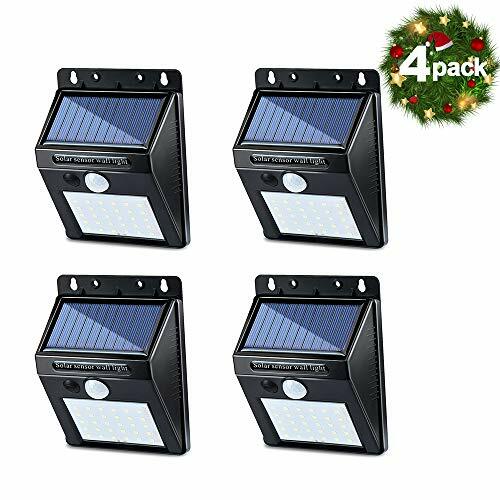 Tagged （4, Activated, Auto, Christmas, Deck, Garden, IP65, Light, Lights, Motion, Omicoo, On/Off, Outdoor, Pack）, Patio, Radar, Security, Sensor, SENSORS, Solar, Wall, Wireless, Yard. Bookmark the permalink.